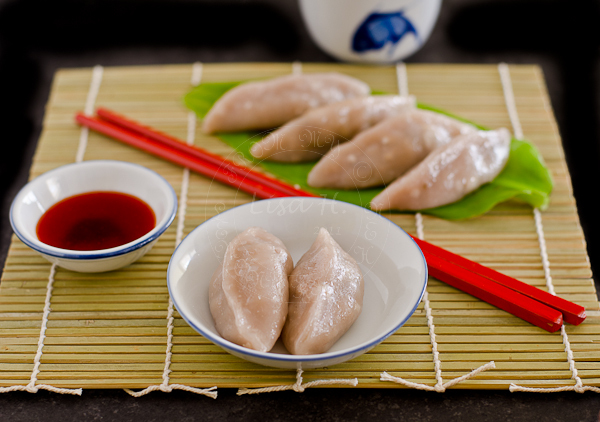 Have you tried or heard of Soon Pan (pronounced as soon pun) or Bamboo Dumplings? There can be one explanation why my Hakka man has zero knowledge of his 'clan' dish ~ his late mom was from different clan ~Teochew, and obviously she would have prepared mostly Teochew meals for her family. take note kids!!! the hand that rocked the craddle~ shape the future and rule the world... I am refering to me....OK! ~ there are many Chinese clans around the world... dialect, food preparation.... even traditions and customs are different from one clan to another... well ... China is a such a huge country... right? Bamboo dumplings may looked like gyoza or pot sticker... but taste nothing like gyoza. Filling ~Heat oil in a wok and saute the garlic and prawns until fragrant. Add miso paste, chicken, mushrooms and fry until the chicken is cooked and fragrant. Add bamboo shoots and add seasonings. Cook until the mix is slightly on the dry side. Leave it to cool. For the skin ~ Combine the mashed yam and flour and knead into a soft pliable dough. Roll the dough into a 3mm thickness and use a cookie cutter to cut into a round shape. Place the filling and wrap to seal it up. Place on a greased banana leave and steam for 8-10 minutes depending on the size of the dumplings. Remove and brush with oil. Beautiful dumplings! I'm a big fan of bamboo shoots. Nice filling. Very unique dumplings, and they sound delicious too! what a coincidence, i just made some hakka spring rolls 2 days ago , guess it's from the same book! You've done a very nice job here in wrapping the dumplings, shall take a look at gojee! Shall I interpret that soon means bamboo shoot? I love dumplings with bamboo shoots : ). Those bamboo shoots dumplings look amazing! 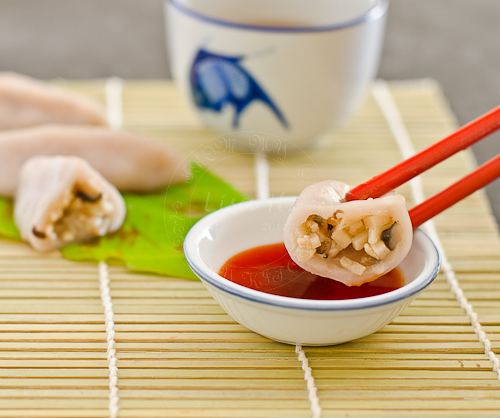 I love almost any kind of dumplings and I think I have tried something very similar to soon pan but totally vegetarian. I love your version better because it uses prawns ...:D)!! How's the skin? I've been looking for da perfect skin! My mom's hakka but she hasn't made these for us although we eat them quite often at my aunt's place - it's pink colored though but I imagine yours is equally nice too :) Love the shots of the innards! As a half-Teochew, I am more familiar with Soon Kueh (also a Teochew kueh with bamboo shoots fillings). But I know a friend who is Hakka and I know Soon Pan from her. those are some gorgeous looking dim sum! I've nv heard of soon pan before, are they the same as soon kueh?? anyway i found you from MM, which i took part in too (: thanks for sharing!